"The Lord Never Tires of Having Mercy on Us"
We begin today, as People of God, our Lenten journey, a time in which we seek to unite ourselves more closely to the Lord Jesus Christ, to share the mystery of His Passion and His Resurrection. The Ash Wednesday liturgy proposes to us first of all the passage of the prophet Joel, sent by God to call the people to penance and conversion, because of a calamity (an invasion of grasshoppers) that was devastating Judea. Only the Lord can save us from a scourge; therefore, it is necessary to beg him with prayers and fasting, confessing our sin. The prophet insists on interior conversion: “Return to me with all your heart” (2:12). To return to the Lord “with all your heart” means to undertake the journey of a conversion that is not superficial and transitory, but a spiritual itinerary that concerns the most intimate place of our person. The heart, in fact, is the seat of our sentiments, the center in which our choices and our attitudes mature. That “return to me with all your heart” does not involve individuals only, but is extended to the whole community; it is a convocation addressed to all: “gather the people. Sanctify the congregation; assemble the elders; gather the children, even nursing infants. Let the bridegroom leave his room, and the bride her chamber” (verse 16). The prophet pauses in particular on the prayer of priests, noting that it is accompanied by tears. At the beginning of this Lent, it will do us good to ask for the gift of tears, so as to render our prayer and our journey of conversion ever more genuine and free of hypocrisy. This, in fact, is the message of today’s Gospel. In the passage of Matthew, Jesus rereads the three works of mercy foreseen in the Mosaic Law: almsgiving, prayer and fasting. In the course of time, these prescriptions were impaired by the rust of exterior formalism, or were really changed into a sign of social superiority. Jesus puts in evidence a common temptation in these three works, which can be summarized, in fact, as hypocrisy (he names it a good three times): “Beware of practicing your piety before men in order to be seen by them .... When you give alms, sound no trumpet before you, as the hypocrites do .... When you pray, you must not be like the hypocrites, for they love to stand and pray ... at the street corners, that they may be seen by men .... And when you fast, do not look dismal, like the hypocrites” (Matthew 6:1.2.5.16). When we do something good, almost instinctively a desire is born in us to be esteemed and admired for that good action, to get some satisfaction. Jesus invites us to do these good works without any ostentation, and to trust only in the Father’s reward "who sees in secret” (Matthew 6:4.6.18). Dear brothers and sisters, the Lord never tires of having mercy on us and he wants to offers us once again his forgiveness, inviting us to turn to Him with a new heart, purified of evil, to take part in his joy. How are we to receive this invitation? Saint Paul suggests this to us in today’s Second Reading: “We beseech you on behalf of Christ, be reconciled to God” (2 Corinthians 5:20). This effort of conversion is not only a human work. Reconciliation between us and God is possible thanks to the mercy of the Father who, out of love for us, did not hesitate to sacrifice his Only-begotten Son. In fact, Christ, who was just and without sin, was made sin for us (v. 21) when on the cross he was burdened with our sins, and in this way rescued and justified us before God. “In him” we can become just, in Him we can change, if we receive God’s grace and do not let the “favorable moment” pass in vain (6:2). 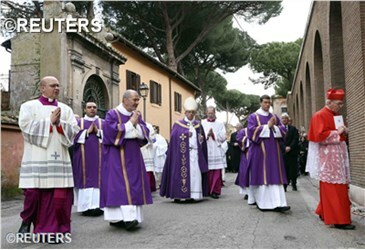 With this awareness, we begin our Lenten itinerary confident and joyful. May Mary Immaculate support our spiritual battle against sin, accompany us in this favorable moment, so that we can come to sing together the exultance of the victory in the Easter of Resurrection. Shortly we will carry out the gesture of the imposition of ashes on the head. The celebrant pronounces these words: “Remember that you are dust and to dust you shall return” (Cf. Genesis 3:19), or he repeats Jesus’ exhortation: “repent and believe in the Gospel” (Cf. Mark 1:15). Both formulas constitute a call to the truth of human existence: we are limited creatures, sinners always in need of penance and conversion. How important it is to listen and to accept such a call in this our time! Therefore, the invitation to conversion is a spur to return, as the son did in the parable, to the arms of God, tender and merciful Father, to trust in Him and to entrust oneself to Him.